Recognizing that some of our patients come from out-of-state, Dr. Kuang has made special lodging provisions to make the overall experience as simple and relaxed as possible. The Southwest Fertility Center for Men is conveniently located near where the Interstates I-40 and I-25 meet in Albuquerque, New Mexico. This provides convenient access right off the highway for his patients. Recently built, it is designed in an appealing Southwestern style and is within minutes of the historical Old Town district, Route 66, the Turquoise Museum, the Explora, the Museum of Natural History, the Rio Grande Zoo and the Rio Grande. Looking for a cozy comfortable bed & breakfast? This is the spot for you. 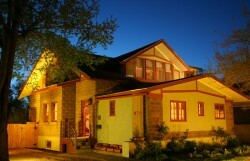 Closely located to our office, this quaint and rustic home has an enchanting feel with incredible hospitality. Find the comforts of home away from home. While you are planning your trip with us take advantage of some of the discounts that are offered by the spas at Embassy Suites and at Alluraderm. Call and mention our name and they will give you a discounted price on services and products. Check out their websites to get a list or “menu” of what they offer.